Royal icing is a baker's staple for decorating cookies and cakes, and most recipes call for egg whites or meringue powder. However, there are a few variations that are suitable for vegans or anyone who requires an egg-free icing, and they can be just as tasty as regular royal icing. One of the following recipes should suit your needs. Give each one a try, and decide which one you like best. Measure the sugar and pour it into a clean glass bowl. Add the milk, and stir it until there are no lumps of sugar. Stir in 2 teaspoons of the corn syrup; if you want a thinner consistency, add another teaspoon of syrup. Measure the sugar into a clean glass bowl. Add the milk and blend until the lumps are nearly gone. Add the corn syrup and continue to blend until smooth. Add the almond extract and blend for another 10 to 15 seconds. In a glass bowl, whisk together the sugar, cornstarch and xanthan gum. Using an electric mixer set on low speed, slowly add the water. Add the extract and continue mixing until the icing is smooth and thick enough to pull up peaks. 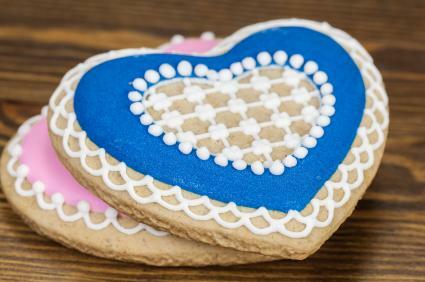 Royal icing can be used to pipe flowers, garlands, strings, lace, and figures. It's also used for constructing and decorating gingerbread houses, so you may need to adjust the consistency of a particular recipe to suit your needs. If you need thicker icing, such as for piping flowers, add the liquid slowly while mixing and stop when you reach the desired consistency, even if that means not using all the liquid called for in the recipe. You can also mix in a little more confectioner's sugar if your icing isn't thick enough, but this is more likely to leave some lumps. It's usually better to be conservative with the liquid and only add as much as you need. 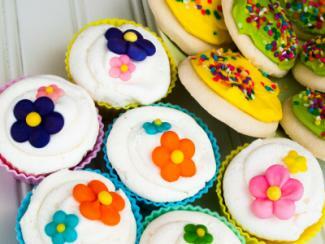 If you need a thinner icing, such as for string work, add a few more drops of liquid to thin the icing slightly. If you plan to use the color flow technique, you'll need two different consistencies. You'll need a thick icing to pipe your outline, and a thin icing to fill it in. 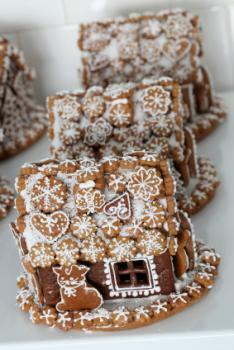 Once your icing is mixed, you're ready to begin decorating. Separate the icing into several bowls and add gel food coloring, or just use the white icing as it is. Simply fill a pastry bag, cover your bowl(s) with plastic wrap to keep the icing from hardening while you work, and pipe away!